Editor's note: This Veterans Day, we’re celebrating our veteran’s contributions and successes as entrepreneurs, by highlighting a handful of the 3.7 million businesses run by veterans in the U.S. Today, we hear from Derek Bennett, former Army Captain and Chief of Staff at Iraq and Afghanistan Veterans of America (IAVA). When Paul Rieckhoff returned to the U.S. after serving in Iraq as an Army First Lieutenant and infantry rifle platoon leader, he couldn’t help but notice two things: how difficult the return to civilian life could be, and how important it was for veterans to join the national dialogue in the media and on the ground. Starting IAVA was his way of doing something about it - and it has accomplished quite a bit since its inception in 2004. IAVA is the country's first and largest organization dedicated to supporting and representing new veterans and their families, with nearly 300,000 members and supporters. And we’re as dedicated as ever to our original mission: helping veterans understand the benefits available to them, ensuring their voices are heard in mainstream media, and giving them a safe community to ask questions and get advice from fellow vets. A lot of amazing people have helped us get where we are now - a lot of selfless veterans, generous civilians and dedicated employees. But we also couldn’t have done it without some help from technology like Google Apps. We’re a mobile company: we have offices in New York and Washington, D.C., but often travel or work from home, and our volunteers come from all over the country, so we have a pretty flexible work policy. Since Apps allows us to access our email and documents from anywhere, whether on our laptops at home or the mobile Drive app on our tablets, our teams can get their work done whenever and wherever they need. Google Spreadsheets have completely revolutionized our volunteer signup process at recruitment events. Instead of having people sign a piece of paper, entering their names on a spreadsheet, and emailing the new version around, we have our team take tablets into the field and enter information directly into a Google spreadsheet. That way, we know everything is up-to-date at any given moment, not to mention we save time and minimize the risk of typos or forgotten updates. While Spreadsheets help us bring in new volunteers more efficiently, Hangouts make it possible to build camaraderie between our team and those volunteers. We recently launched Squad Leaders, a program where IAVA ambassadors host barbeques, set up networking events and provide professional mentorship for vets in their local communities. 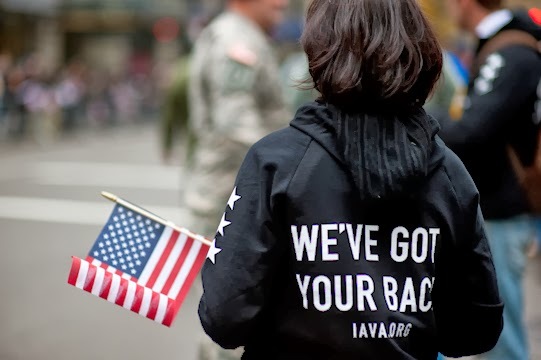 We want to make sure our Squad Leaders feel as connected to the core IAVA team as they do with the vets in their neighborhoods, and Hangouts help make that happen. We use them to conduct Squad Leader training sessions and to run regular check-ins, so our ambassadors feel personal connections with a program that’s otherwise geographically spread out. Veterans are service leaders, entrepreneurs, teachers, students, parents and politicians. IAVA’s mission is to make sure they’re all those things and everything else they want to be - that they feel fully supported and represented as citizens. Our veterans have already committed so much to their country by they time they return home that they should feel empowered to accomplish even more in the years ahead. With 2.6 million veterans, it’s no easy feat, but with the help of a growing team of employees and supporters, I think we’re off to a pretty good start.